Below are some scanned in maps of the region. You can click on any of these maps to see it in greater detail. In MS Internet browser, double click on the map and press the icon to be able to zoom in on the map. Or right click it to either download it to your computer, or to open it in another window so as to compare these maps against the Cesky Raj bus route and schedule (again, right click to select Open in New Window if you want to compare easily). I put little pink dots on trails where I know it is very beautiful. I will try to go to Jicin (bottom right map) this weekend to check out the path heavy section to it northwest (and update that map later). If you would like to print out the larger version of these maps and the 700KB JPG quality is not good enough (the ones you download when you click on the maps below), I also have the much larger BMP versions. In any case, I will try to find someone with a quality colour printer to print out quality versions for all of you once you get here. Below you will find an explanation of the trails I picked out, with a link to the pictures on this website. Click on the maps below to view them in greater detail (right click to download to your computer). Get into the campsite from Jicin either by local bus or by hired bus. I would suggest that people already be dressed for running. If taking the local bus, someone can come with a van and pick up all the luggage and drop it off either at the camp or to the hotel. I would suggest that for today's trail go south from the camp along the green path (you should be able to see small pink dots on the map showing the routes I am proposing), southwest to the red path, and then southeast along the red. Near the beginning of this red path, keep your eyes out on your left hand side, as there is some tasty spring water you can fill into a plastic bottle or something!! You eventually get to Nebakov (where we can have a quick beer stop if people like) and the goal is to head north east towards the Trosky castle ruins. To do this, you can either go up along the blue, green or red. Perhaps the faster runners can go up along the red and the walkers along the blue. All these eventually hook up together before Trosky. Have a stop and check out Trosky and then continue along the blue to Borek. Maybe quick beer stop there. From Borek head southwest along the yellow, along the lakes back to the campground. Suggest a beer/snack stop at Vidlak, half way to the camp, as they cook rather good here. Perhaps just Garlic soup (chesnechka), to save your tummy for the roasting pig! Continue to the camp, and perhaps take a dip in the lake just to its south. Alternatively, for the walking snails, they can go northwest along the red from Trosky, straight to Vidlak. I can take additional detours for the fast runners and all this can be arranged that day (live hair) based on demand and requests. For those who come later in the day, they can phone me on my mobile (numbers on entrance webpage) to find out where we are, and try to hook up with us. Mala Skala itself is great, and if it happens to be really hot, you can have a fantastic swim down the weir in the river. There are also lot's of cool pubs. Across the river along the blue (not a fantastic walk), you will eventually run into Drabovna, where a castle once stood on the cliffs. First six pictures here. If you have the time, you can head back along the red and go north to Frydstejn (not a fantastic walk - picture), check out the Frydstejn castle and then continue back towards the Vranov Pantheon castle (8 pictures following here). Perhaps the runners will want to do this leg as well. Across the river on the same side as most of the town (south side) is a fanTAStic walk, and hence why we want to save this for Saturday (16 pictures following here). Half way through that walk, at the pink number 1410R1, you will find a pub (note the picture of a half litre of beer on the map) which is perhaps our second favourite. Picture here. From there we can complete the yellow, if desired, and then continue south east along the red until Koberovy, where we switch to the blue heading south until Rotstejn. From there we can go southeast along the yellow for a snack and beers at Podluktusi. 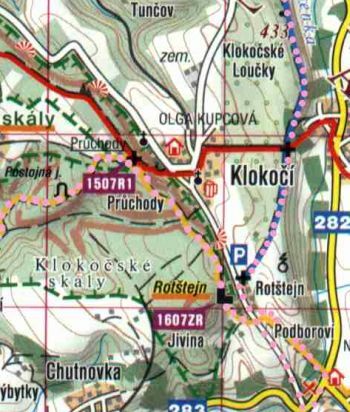 From there go up to Rotstejn, and continue along the yellow, eventually heading west along the yellow towards Mirova pod Kozakovem (direction back to Turnov). On the way to Mirova there is a place called Mala Amerika (Small America - if I remember correctly), which is a maze of caves and large caverns. Didn't get a chance to check that out yet but heard it was fantastic. Before heading southwest along the yellow, you may want to continue walking along the ridge along the red for a bit (heading northwest), and then head back to hit the yellow again. Renting a bus for all of us, which will leave early morning, take us for a beer break at the Kost castle, and then to Branzez where we walk/jog along the pink dotted trail eventually to the Valecov castle. Then the bus will take those going back to Prague to Mnichovo Hradiste, where you can catch the train leaving from Turnov at 18:15. To repeat, from Branzez we can walk north along the yellow (pink dots on map) to Prihrazy (first four pictures here), a bit above the lake in the centre of the map, and go up (northwest) the red trail to Krasna Vyhlidka (Beautiful View), where they cook fairly well and where you can stop for lunch. Picture sample. Then continue along the red to the various castles. Picture samples here, here and here. Once you get to the last castle/ruin (Klamorna), you can continue along the red (not as nice) and end up in one of our favourite pubs, nestled into the Valecov castle. First seven pictures at top of page here. From there get a ride back, or jump on the 17:17 local bus at Bosen-Zasadka to take us back to Kost at 17:47, walking back to the camp from there along the green. On this same map, another worthwhile visit is the Kost castle, below right/southeast along the red from the lake in the middle of the map. In the Stary Hradek area in the centre of the map. To it's upper right is a nice lake with sandy beach. Costs 40 Kc to get in but well worth it. Will try to scan in a more detailed map of this particular area and the trail which was suggested to me. Good restaurant at Turisticka Chata. Pictures here. In the morning, a 9:55 bus from Hruba Skala takes us to Holin Prachov Cesky Raj at 10:38. Then I would suggest going down to the lake and catch a yellow bus (or walk) from Jinolice Koupaliste at 17:33, one bus stop to Libun Brezka at 17:40, from where you can catch a red bus at 18:45, arriving to Hruba Skala zamek at 19:19. Hopefully I got this right. This area is close to the campsite and many people will be staying at the hotel in Hruba Skala, so a Tuesday walk here would be ideal. Start at the Hruba Skala hotel, dive in along the yellow to the foot of the pillar formations you overlook from the hotel, and wind through this maze of beauty, taking careful note to see the various climbing points (maybe you will see a lot of climbers). That eventually takes you to Valdstejn castle, where you can have a quick snack, to head back along the ridge and blue (picture here), back to Hruba Skala. Those who want to continue on to Turnov to head back to Prague can continue northwest along the red trail. Unfortunately, the train station you need to get to is not on this map, so refer to the Mala Skala map (top right above). You would continue along the red until you hit the yellow, at which you would head west to cross the river. The yellow should take you right to the main train station (the little white square on the rail line by the green info circle). Here is a 3D map of the area, which you can see a larger image of by following the instructions in the top paragraph.